Though my Mom being a working woman would manage to make Amboli only once a week, but in typical kitchen in Ratnagiri it is prepared more often and served with Coconut based gravies and with chutneys and Vangi-Batata-Shenganchi Amti (a dish from which Sambar has supposedly evolved) for Breakfast. During weeks when we abstain from Non-vegetarian food, Amboli is best enjoyed with Kala Vatanyachi Usal (Black Peas Curry) by a Konkani and this combination of meal defines our comfort food while on other days Amboli is best enjoyed with Chicken Curry, Prawns Curry and Tisrya Masala (Clams thick gravy preparation). This comfort food on weekends is always followed by an uninterrupted couple of hours of sleep in the afternoon-aah a pure bliss! Such is our pure love for food. India’ western coastline that spans across coastal districts of states of Goa, Karnataka and Maharashtra is also known as Konkan coast. The similar geographical and metrological conditions govern the food crop pattern and other food related choices in this region. Rice and seafood are two primary food choices of inhabitants of Konkan region. Several preparations of rice like Amboli, Gavan, Sanna etc. dominate the Konkani cuisine. These delicacies are often served with Coconut based gravies. I have witnessed online world filled with lot of confusion about Amboli and often food bloggers have mistaken it for Ghavan and it’s important to clear this misconception. This case of mistaken identity can be attributed to the fact that both have rice as a primary ingredient (though Rava Amboli replaces rice with Semolina). However, besides this similarity these two Konkani dishes are completely different from one another. Ghavan is a quick bread, made with homemade rice flour batter and the process of fermentation is not part of its preparation process. However, Amboli derives its name from the culinary process “Ambavne “which in Marathi refers to “fermented “! 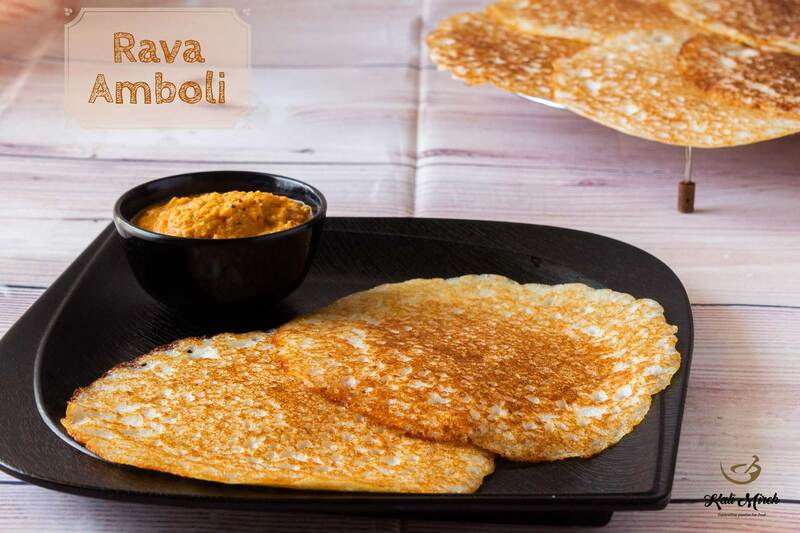 Today I am sharing with you Rava Amboli recipe – a lighter version of Amboli. It’s a perfect breakfast option and could also be part of your weekend brunch with your favorite chicken/prawns curry. P.S. I served Mangalorean chicken ghee roast with this Amboli to my family and they just loved it. Let the batter ferment overnight or atleast for 6 hours. Keep it covered in a warm place- kitchen platform, above Refrigerator. Personally here is what I do, Heat microwave for 4 mins on High. Then switch off the microwave and keep this batter inside the microwave. After 9-10 hours, let’s uncover the batter now. Gently mix. Do not stir vigorously. I am pretty sure Ambolis will be soft and light. We have cooked for about a min on medium heat. The edges start to get brown. Let's turn and cook from other side. Underside has cooked nicely. Put few drops of Oil at the sides. Cook from other side. We have cooked for about 1 and ½ mins.